As you may have figured out, I LOVE file folder games. I think it is great that they are self-contained, you can store all the pieces together, and they are perfect for independent work systems because with Velcro, they stay together so you can check them when it’s finished. However, the one snag I always ran into was how to keep the pieces with the file folder. 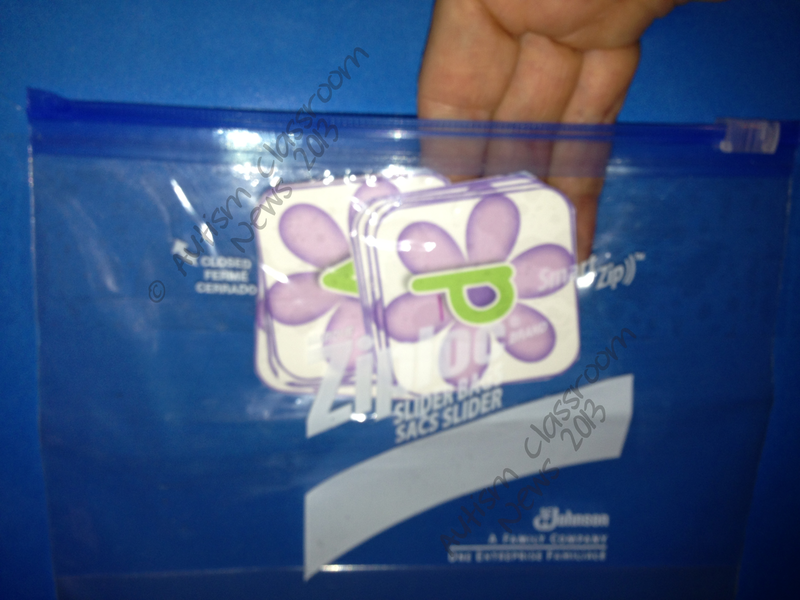 I tried a ziplock bag velcroed to the back, but it always seemed to detach itself. 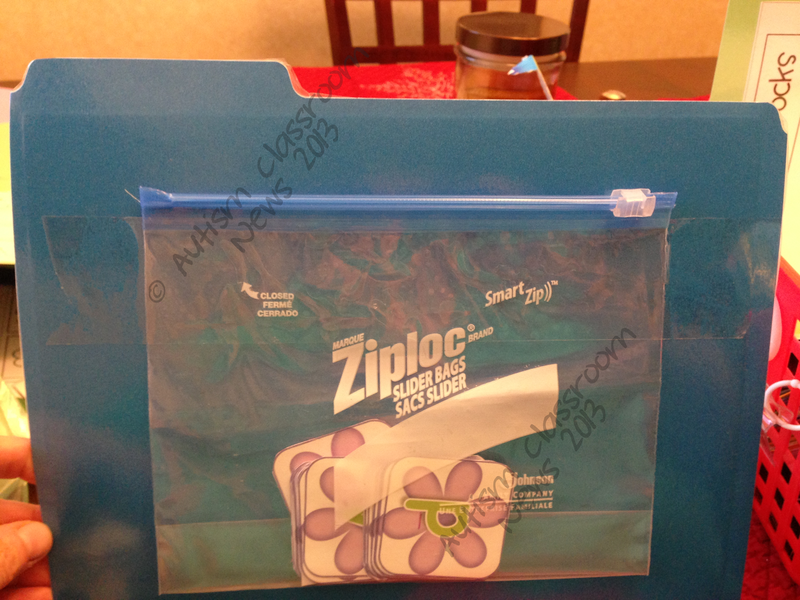 I can store the pieces on the Velcro for the file folder itself. However, if there are more pieces than items on the folder, there aren’t enough spaces. And, when I get ready for the student to use it, I have to dis-assemble the pieces for the student to complete it. This is where friends come to the rescue! Several years ago a teacher (I’m sorry that I don’t remember who) shared this tip with me and I wanted to share it with you. You put the extra pieces in a Ziplock bag. Then take a piece of clear packing tape–the thick kind used to seal packages (yea, hence packing tape)–and cut it slightly longer than the width of the Ziplock bag. Put the tape just underneath the zipper of the baggie (like below). The pieces can be stored inside. And you can still open and close it as you can see below. Thanks to my sister, Superteach56 for her willing photography of the strategy while she was making a file folder game. Anyone have other ways that work for them to fasten the pieces to file folder activities? Thanks for the tip. I have used the tape before and usually tape it across the bottoms and sides, but after time the bag seems to tear from putting hands inside to pull out the pieces. I am looking forward to changing the placement to see it that last longer. I had the same problem…my sister figured out to put it horizontal which at least should store better. Wow, what a cool idea! I'll have to try that! I use laminated envelopes in different sizes. I laminate the envelope (with a 1.5 mil), then carefully slice the opening of the envelope with an Exacto knife. With a double sided tape, I stick the laminated envelope to the back of the laminated folder. To close the flap of the envelope, I use Velcro coins. I've used the bags in the past, but the students eventually rip the bags. 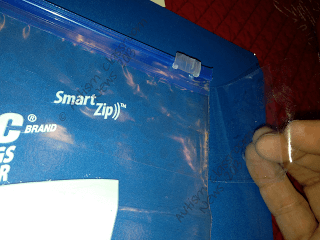 The laminated envelopes are more expensive than the bags, with the laminate, double sided tape and Velcro coins, but I find they last longer with the group of students I teach. Thanks for sharing another way! I've used CD pockets that are adhesive backed. When the sticky dot doesn't work anymore, I put velcro coins in its place to keep it closed. I would never have thought of that! Thanks! 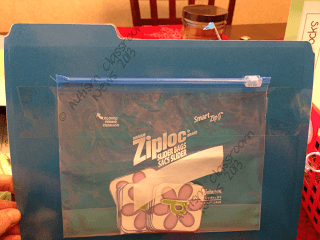 My students were frustrated when the folder did not lay flat (and I was frustrated that they did not fold flatly), so I cut the folder at the fold and laminated them with a tiny space between them so that the laminating film is the "hinge." The ones I had already made, I cut and used packing tape as the "hinge," but the ones with laminating film last longer. That's a cool idea Michelle! I usually just weight them down with books until they lay flat. Thanks for sharing!